Southside Garden Supply is locally owned and operated by Rob & Julie Martin. Southside Garden Supply has expanded and up-sized into 2 Super Stores. Find us at our 8,000 square foot store in Wasilla and our newest 20,000 square foot store in Anchorage. It was bitter-sweet for us to close our South location as it was where our dream began; we raised our son out of the location. However, we believe that we’re creating the absolute best overall experience for our customers by up-sizing into one GIANT location. We are stocked up and have all of our great employees in one central place so you’ll get the best products—with expert help—in stock every time. We’re super excited to offer Exclusive Member Pricing, pallet pricing and commercial sales. Stop in and say hi to us. We’re in the Arctic Super Store everyday! They say time flies when you’re having fun and it has proven true for us. We have now been open for 5 years and have recently taken over a 20,000 SqFt facility. We still love getting up in the morning and going to work every day with smiles on our faces; that tells us that we’re in the right business! We have put a lot of thought into our locations and product lines. We didn’t want to be an ordinary garden store, striving every day to be Alaska’s Premier Indoor Garden Super Store. We do not carry every garden product on the market, only the ones that work. We offer a 6 month over-the-counter exchange with receipt on all of our electronics and will send you out of the store with the knowledge to succeed, a custom built feed chart and not a bunch of stuff you will never use. We build all orders to fit the customer’s specific needs. Our inventory is ever-changing and growing as the industry evolves. We build custom feed charts and provide consultations on grow room layouts. We know that if you take our product home and your gardens are successful that you will keep coming back. We also offer Exclusive member Pricing. There’s no reason to shop all over town. We have ALL of Anchorage and the Mat-Su Valley covered. Not near a store? Give us a call for order and delivery options. We’re (Rob and Julie) almost always in the store and would love for you to stop by and say hi. Or give Rob a call. He’s available 24/7 at 351-8207 for questions or if you need help after hours. While you’re in don’t forget to pick up a gallon of our FREE fresh brewed living compost tea, our way of thanking customers. Your plants will love you for it! We are happy to be able to serve all of Anchorage and Wasilla with our 2 convenient Super Stores. Learn more about hydroponics, Wasilla residents rely on. Our Wasilla shop is just a short 20-minute drive from Palmer. 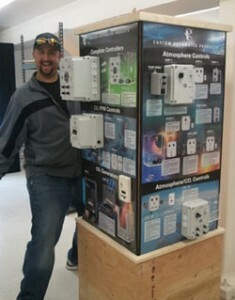 We are ready to take Alaska to the next era with indoor gardening’s cutting edge advanced products.